Every season the catalogue of course offerings from the Park District comes in the mail; there’s gymnastics and kiddie ballet, swim lessons and, in the summer, camps galore. Every season, I look through the book, take a look at our schedule, and think about which classes we could fit in; Monday evenings aren’t terrible, unless there’s Brownies, because that’s the day I don’t commute; Wednesdays are hectic because my husband works late and the kids have early release. Saturday mornings could be okay, but I’m reticent to let anything compromise the sanctity of the one weekly chance we have to sit around in our pjs and engage in the great pancake versus French toast debate. Inevitably the course registration opens, the classes fill, and my kids remain uncoached in swimming, soccer, and kiddie ballet. I exaggerate a little. Both girls go to church each week, and the older one sings in the children’s choir and takes piano lessons from a neighborhood teenager. The pre-schooler is in daycare 35 hours a week and somehow, though there are only 20 kids in her room, there is a birthday party virtually every weekend. They have friends; they are far from socially isolated. All of these things – except snow day numbers four and five – are good. Fun and life-giving and worthwhile. Getting to all of them, keeping all these balls in the air, tending to the added details, has sometimes worked to encourage better planning: we do bigger, less-frequent grocery shops and more meal planning. We’ve asked the kids to take on more responsibilities (ie, setting the table, putting away laundry) and they’re watching less tv. We’re rallying, working better as a team, because there’s just not time for petty arguments. That’s the upside to pushing the schedule, to the busy life. But we’re tired. The teenage piano teacher cancelled a lesson when she got bronchitis, and we were so grateful. An unscheduled thirty minutes on a Monday felt like a reprieve. One morning, and then another one, the girls were skirmishing over borrowed leggings, and I snapped, I do not have time for this from you. I am sitting and typing this at bedtime, as I sit in the bottom bunk with my four year old, because I wasn’t watching my scheduled deadlines, and somehow I have twenty-eight thousand things due this week. I fear that when I – honestly – suggest that I have no time for clothing arguments (there is never time for clothing arguments), my daughters will hear I do not have time for you. My older girl was late for school the other morning. 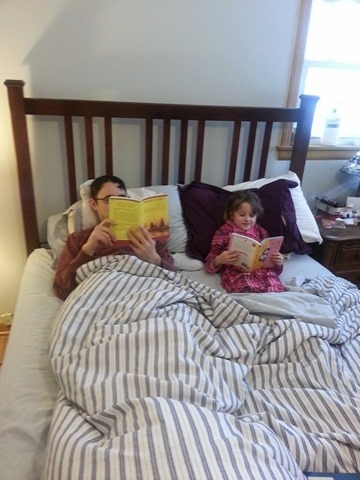 She’d awakened early, grabbed her library book and climbed in bed with me. I was reading and drinking coffee; all days should start with essays and coffee in bed. But when it was time to get dressed, to eat, to pack lunches and go, she was slow. I had to ask her six times to get moving. I was so frustrated with her: how could we be late when she’d gotten up so early? But I couldn’t blame her. I’ve never been someone who was great at personal prayer practices; maintaining devotional rituals each day or even each liturgical season. Rather, the primary way I experience the presence of the Holy Spirit outside corporate worship is through interactions with people or texts I’ve not planned to spend time with. The student who comes in to chat; the colleague who pops by to say hello; the essay collection I grab on the way out the door; the article someone shared on Facebook. Somehow I always end up hearing a word I need, seeing something holy revealed. When all the reading is assigned and all the meetings are scheduled, when all the time is spent in the car driving from one thing to the other, I miss the presence of the Holy Spirit. My daughter, sitting in my bed with her book the other morning, resisting the call of the daily slog, can sense there’s something good and life giving about restful engagement with a story. Many of the commitments that made these last months so crazy are drawing to a close. Cookies are sold, money is turned in. Book club and winter will both, mercifully, end later in March. I want to remember this feeling, though, of feeling so full of activity that I felt devoid of space for the holy. I want to remember, to pay attention, so that I don’t overschedule us again. It’s a small thing. The correction is made easily enough. There need be no lasting negative consequence of these tough few months. But I know this: when my children are older, when they are thinking about what sort of work gives them joy, when they are thinking of whether they will pursue professional vocations and family life and community associations, I want them to remember their childhoods as full of the Spirit’s presence, of long days spent goofing off or talking together or simply reading side-by side. ” I want them to remember their childhoods as full of the Spirit’s presence.” This is beautiful truth. Thank you for naming it for me. We have resisted so much of the over-scheduling of our kids’ lives (although we do have a few activities that snuck in, as you mentioned). And sometimes I feel guilty – that my kids aren’t in sports, that they’re not yet taking music lessons, that we aren’t doing more. Then I remember this: that in my life, the Spirit shows up when I do less. I hope I can try to leave this space for my kids, too. So lovely. Don’t know how I missed this when it posted!